As an artist, Pan has been recognized by various organizations (such as Trans 100, an annual list that honors the most innovative trans activists in the United States) for his extremely reflective photography and involvement with social justice. I luckily had the opportunity to ask him some questions regarding androgynous fashion, the Asian-American trans movement, and his rejection of cis white subjugation. Like his work, Landyn Pan is daring, bright, and unapologetic. Who is photography, and what are they to you? A business partner or a friend to rant to? The muse that sits on the top of your piano? Abstract or literal answers welcomed. I think I know what true love is, because I know photography. I feel like photography is very essential to me, a part of my heart; part of my soul - a way to express my feelings or the actions that I might not have the words for. For me, photography is a way to connect to new people or with other photographers, or with other trans people. It’s not that your lens necessarily focuses on the human body as a subject / if anything, it’s more of a device to carry your politics out to your consumers. Do you find yourself being fixated on any part of the human body whenever you take pictures? To what extent does that specific part fascinate you? I don’t focus on any particular part of the body. Rather, I think about the language in the relationship between two or three people’s bodies. The earlier audiences for my works were mostly local people who were likely going to recognize the faces of my models, and the recognizability would’ve been distracting from the message I was trying to convey. Now that I have a more general audience online, I have a lot more freedom with expressing faces. It’s more about identity now rather than society, a lot more personal and human. I have actual people with identifiable faces that I actually want to be recognized. Now it’s about having my Asian trans faces in there, making sure that people with our identities are seen. This recognition is really valuable. And as a trans person, I’m really curious about bodies. I just find the human body to be really beautiful, and that’s how my fascination with bodies also began. The work that most notably struck out to me was your collection that had you and your models mix-matching traditional Chinese clothing with contemporary Western outfits. And not only were those OOTDs killer, your caption below was incredible: “We’re not here to be your math tutors, or your tech support, or your exotic fantasy. Our men aren’t your weird comic relief, our teenage girls aren’t your masturbation tools, and our women aren’t your soldiers’ property. We’re not here for you.” Tell us anything about these photographs. I am really into playing with fashion and androgyny. As a trans man, after going through hormones and surgery, society sees you as fixed. Society tells you “hey, it's time for you to conform.” Naturally, I'm like no. I'm going to put up a fight. The idea behind these photographs was impromptu. I was borrowing some clothes from a female friend when I saw a traditional Chinese shirt. So I brought up the idea to Tessa [my friend who was also in the shoot with me] what if I were to mix Western and Eastern clothes, in addition to masculine and feminine styles. We put together the outfits on the spots at the shooting location. While shooting, I had a lot of thoughts and emotions running through my mind, and it was really powerful to see us in those clothes. This empowerment was what inspired the caption in my post. We know that fashion is a huge statement, and we're familiar with clothes as a statement about sexuality. But we don't see it used as a statement about growing up in multicultural environments. We don't see it used to narrate stories of trying to survive in two cultures at once. That's why it was so cool to me. To what timbre were these emotions felt? Did you also feel a sense of loss in regards to this sort of diaspora? Or was it overwhelmingly an empowering experience? Initially, I did feel loss. I thought about how Western clothes have influenced a lot of East Asian culture, like suits and ties, a traditionally Western ensemble. To wear a mixture of these cultures felt very authentic. I had never expressed myself in that way before. I've only thought of fashion in the context of gender and sexuality. Using it in this new way to express multiculturalism was probably what brought out these powerful feelings. 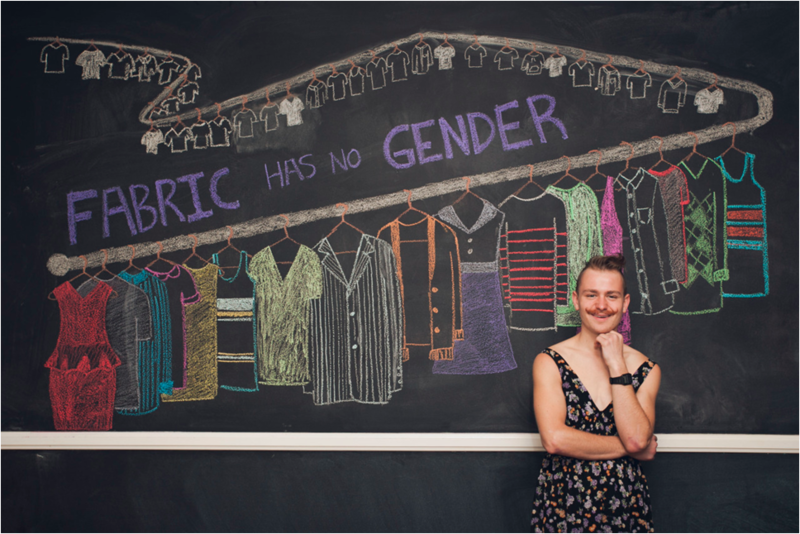 Speaking of fashion, there was a great picture you did with “FABRIC HAS NO GENDER” written on a blackboard. What are some general thoughts you have on androgynous fashion, and the implications it has on the gay community? Especially for the gay POC community. Do you like where it’s headed? Well, I love androgyny. I'm always striving to become more androgynous. It's how I purposely reclaim my identity as the other. However, I'm also aware of the issues surrounding the presentation of androgyny. Even in that photo – I absolutely love the idea behind it. I love Moon [the model]. But I had an issue with that picture being my most popular work, and I know that it can only be so popular because they’re white. Androgyny often presents whiteness as the default, sometimes even as the prerequisite. Masculinity is also seen as the norm in being genderless, such as when women wear suits and ties, it's immediately seen as androgynous. When men wear drag, it's seen as parodic or overly exaggerated. We have to question why femininity is othered while masculinity is seen as the default and as neutral. When clothing brands market themselves as gender neutral, they always adopt traits from masculinity. They're basically men's clothes that are tailored to fit women, and that's not very revolutionary. I don't know where androgynous fashion is headed. It's just sad that AMAB (assigned male at birth) queer people aren't allowed to explore gender and androgyny in terms of femininity. I hear that you’re doing a project about transmasculinity, and what it means to the POC community. How do you associate the mainstream perspective of transmasculinity with the effeminacy that the white supremacy forces onto Asian people? I haven't actually started that project yet. It might be a year before anything comes out. I have been thinking about it a lot though, and it's been building up. It has to do with a lot of my frustration with the lack of diversity among bloggers that were supposed to represent me. My frustration is still growing, especially with recent surges of articles that are titled 8 REASONS WHY YOU SHOULD DATE A TRANS GUY or BuzzFeed's 26 TRANSMEN WHO'LL MAKE YOU THIRSTY. Later, because of backlash, they changed the title to 26 TRANSMEN WHO ARE TOO HOT TO HANDLE. FTM Magazine today made a post called TRANS GUYS WHO DON'T OWN A SHIRT. So the first article I mentioned is fetishistic and heteronormative. It assumes that trans guys are dating cis women only. When the BuzzFeed article came out, I was like ew / this is fetishistic. And the third article came out – every single one of the people featured were extremely cis-passing, hypermasculine, very muscular, and after that, I was like I'm done. And out of those sixteen people, there were only three or four POCs. So not only are those articles fetishistic, but especially the TRANS GUYS WHO DON'T OWN A SHIRT – it's a horribly narrow representation of transmen for a number of reasons. One, cis people already think that trans people aren't really trans until they had hormones or surgery. These posts just validate that type of thing. Two, a lot of cis people are unaware that transitional health is really hard to access. There's healthcare discrimination, and most trans people are of low income. These posts are just going to make cis people assume that healthcare is accessible, because the people to which the healthcare is accessible, they are the only types of people that are talked about. Three, for the men who don't fit into the hypermasculine mold, it is so, so invalidating. It's going to make it a lot harder for nonbinary and non-traditionally conforming transmen to be accepted. There are already a lot of stories about how feminine transmen have to lie about their experiences in order for medical professionals to see their identities as valid. Articles like these just don't help at all. Why are we promoting this form of hypermasculinity? We've already deconstructed so much / had discussions about why this is so toxic. Even in terms of that type of representation for cis men – I don't get why we're still doing that. We're assimilating into cis standards rather than challenging them. There's also a lot of stories about transmen who perform hypermasculinity and misogyny, because they think that's what they're supposed to do, in order to be taken seriously. Last thing that I want to make clear, is that I'm not really criticizing anyone on the individual level. People are free to do whatever they want. I understand that getting into fitness and bulking up – that can be really affirming for some people. For the first time, you're able to get the body that you've always wanted. I think that it's really beautiful, if that's your truth. But what I'm questioning is why only one type of transman is popular in media. The issue is more with publications rather than individual people, with how they're compiling these lists and controlling the focus on trans representation. It's not progressive at all if only cis-passing people are in the eyes of the mainstream. It's actually the complete opposite of progress. In terms of white supremacy on that aspect – I'll say this, going back to my project about transmasculinity: I want to hold workshops related to dealing with masculinity. I'm thinking about doing two photo projects that, in general, touches all of these ideas. The workshop can be for white people too, the non-passing & non-traditionally conforming white transmen. And the other project. This is the one that I actually have a vision for, so this one might actually come out first. 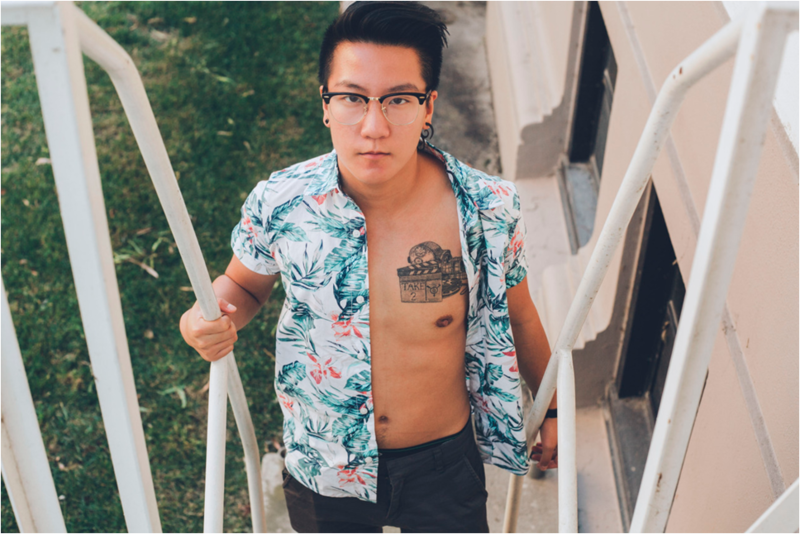 It's a project about my individual experience as an Asian transman. My race has influenced people's perceptions of my gender. These days, I'm read as male a-hundred-percent of the time, I mean, as the vast majority of the trans men on testosterone are. We have passing privilege. But even before testosterone, I already passed as male ninety-percent of the time. And I've always joked that racism and surrounding stereotypes of Asian men allowed me to do that. It kept me safe in some situations. I noticed that my passing rate was different among people of different races. The rate was highest among white people, because they were most likely to enforce Asian stereotypes. Before I changed my name legally, it was a Chinese name, so that people couldn't tell what gender it was. I would talk about not being able to grow facial hair, and white people would be like oh I think that's an Asian thing / my Japanese friend, he can't grow a beard either. There's also that stereotype that Asian men are feminine: skinnier & shorter, even though my cis brother is, above average, six feet tall & a hundred and eighty pounds (where I would be size-wise, if I were a cis man). But to white people, they see me, and I'm short & really skinny. To them, I fit their image of what Asian men look like. A racial stereotype is what made me pass to them. My white friends (also pre-T), who are roughly the same size as me, would still get misgendered all the time. I also find it really interesting, this strange feminization & desexualization of Asian men. This feminization goes against the prized male virility in Western culture. They expect you to be less masculine. Whereas, if someone who was white was less masculine, they would find it noticeable. The stereotype takes over their mind. What is the one piece amongst your entire gallery that you feel gives the least fucks about pandering to the white supremacy? Is it a photograph that’s dear to your heart? I would probably say that it’s the photo with the Chinese clothing set. And the text associated with that. Whenever I see white people’s upset comments over these photos, mainly trying to police my tone, like happier messages would sit better with us whites - then I know that I’ve done well. I already give zero fucks about white people’s opinions. I give zero fucks about cis people’s opinions, or hypermasculine binary transmen’s opinions. I make my work for my people; the people who fall outside of the mold for transmasculinity in the media today. I make my work for myself.